Update: 42 races and $43,000+ raised! We’ve made it past $43,000 raised for the GBS/CIDP Foundation! So, there’s still $9000 to go, and less than two months to raise it! I’m looking forward to the challenge… and I’d love your help as always! Stats: 81% of the way to our running goal, and 83% of the way to our fundraising goal. First, a huge thanks to Dean Coupe for a generous donation of $100, and to Lucy Williams for contributing $45 to her Dad’s fundraiser. I love these people! We’ve of course been running, running, and running more. I’ve now only got 10 races to run to reach our goal, and I’ve even got the calendar mapped out to get it done. 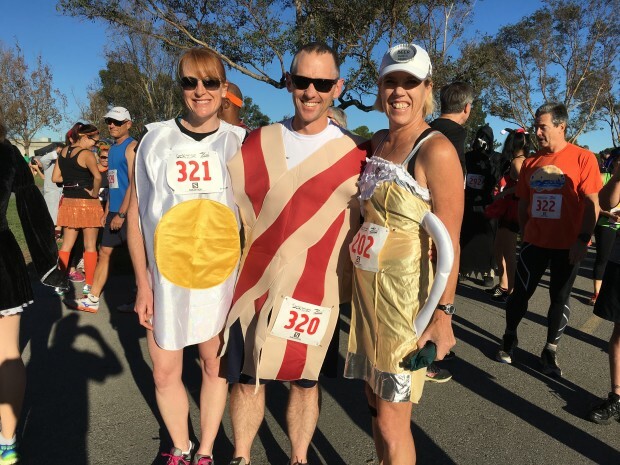 As you can see above, we even donned egg and bacon costumes for a Halloween race (and I wouldn’t recommend running in polyester costumes — it’s warmer than it looks!). Head to navigation on the left for race reports from Colorado, Washington state, and all over California.